SYRIAN RAILWAY - railmeds JimdoPage! In Syria, the road transport is the dominant sub-system; however the significance of rail increased in the last years, especially in passenger transport. Rail transport in Syria is used for freight and passenger transport. The passenger rail transport is mainly used between cities. Urban transport is mainly conducted by bus, minibus and taxi (road). Rail passenger transport grew substantially from 2007 to 2008 (744 Mio. pkm to 1,091 Mio. pkm). The reasons are railway reforms and higher prices of overland buses due to increased gasoline prices. The 2005 introduction of new rolling stock on the Damascus - Aleppo line, and the Aleppo - Latakia line has increased occupancy levels. Since 2003, the Damascus's al-Hijaz railway station has been closed. The al-Hijaz line is a narrow gauge line which was integrated in the Jordanian railway network. The international rail passenger transport is about 9 Mio.pkm. Main destinations are Iran and Turkey. _ Cement: 95 Mio. tkm (4%). _ Export: 3 Mio. tkm mainly to Turkey 9,000 tkm. The export by rail dropped from 2007 (18 Mio. tkm) to 2008 (3 Mio. tkm) due to drastically reduced phosphate exports. 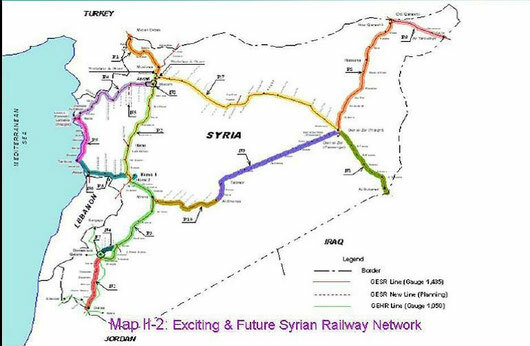 The railway network is operated by the Syrian railway company (CFS) and has a total length of 2,495 km (2008). Major investments are foreseen. - About 4,970 goods transport wagons. Although the railway is maintained poorly, it still operates well, although there are speed restrictions. In 2008 it was agreed to open a joint rolling stock factory with Turkish State Railways at Aleppo. The target for the start of operation is 2013. The only remaining section of a narrow gauge line is the line from Damascus to Jordan. However, this line is not in operation anymore. In 2004 Syria ratified the Agreement on International Railways in the Arab Mashrek, which provides for the implementation of a variety of North-South and East-West links within the region, including the restoration of direct rail links between Syria and Iraq. _ Turkey: two links Nusaybin and Midan Ekbis, 1,435mm; 3rd link under construction (Juman Big) – planned to be opened by end of 2009.
International standards are applied for all current and future projects. _ Construction of railway between Domeir and Al Sharkeyeh to connect Damascus with Albokamal (Iraqi border). 2011. It is designed according to UIC standards with an operating speed of 160 km/h. Central, Eastern and Northern. At the end of 2008 CFS employed around 12,485 staff. There is no specific law or regulation for the railways sector. A new organization has been applied in CFS to improve its performance. Currently, CFS is organized in about 30 functional directorates. The Ministry of Transport is the relevant authority for the railways sector. There are about 16 authorities and companies under the responsibility of the Ministry of Transport. The Syrian Railways is one of them. There is no separation between infrastructure and operation. Such a separation is also not planned. However, first studies on railway reforms have been undertaken. The operations of freight and passenger transport are not separated from an organizational point of view. However, from a revenue perspective passengers transport and freight are managed as separate accounts. There is no specialized railway safety or independence authority in Syria. This is also not planned for the future. For the investigation of railway accidents there is a committee within CFS, whose duty it is to inspect accidents and investigate the reasons. This committee reports directly to the General Director and consists of 7-8 experts. Over the last years the number of accidents has been increasing. In 2005 0.43% of trains have been involved in an accident; in 2008 this ratio was 0.55%. Syrian network with the Jordanian and Iraqi networks. and supported by the EU. The structural reform according to European guidelines has not started yet. It would be beneficial for Syria to start the discussion process on this topic soon, otherwise the competitive disadvantage with other regional railways will increase and prevent the establishment of a well performing rail sector. The exchange of international experience/benefits regarding reform processes could be beneficial to Syria.